While slopes can certainly pose major challenges, it also creates the opportunity to have a property that is truly unique. When designed and built properly, slope challenges can be turned into a multi-level property with tremendous appeal. 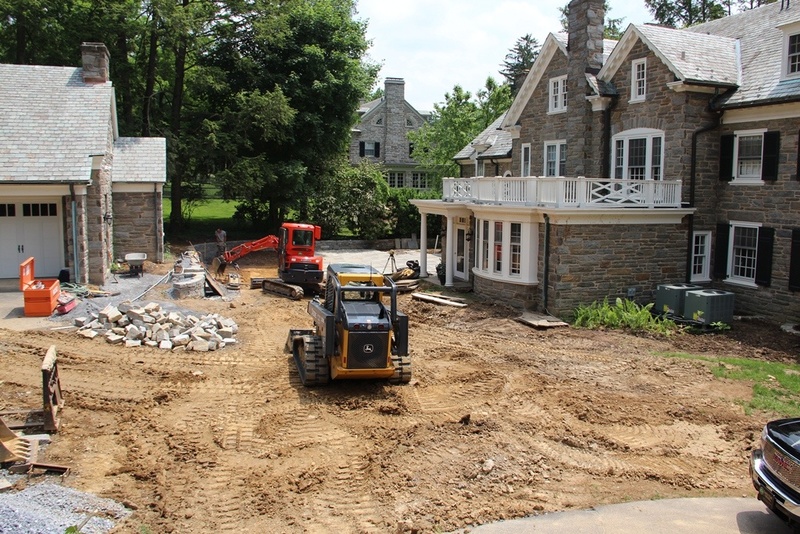 That was the case for this Leola, PA landscaping project. The property had a major slope and the previous landscaping didn’t incorporate it into the design in any way. Instead, the property had a big, single-level deck and then just dropped off. The deck also lacked interest and didn’t really create the entertaining friendly environment the homeowners were looking for. They had an existing lower level pool but the upper portion of the property was primarily desired to be used for entertaining when they were not swimming. The homeowners, who were empty nesters, expressed that they were ready for a change. 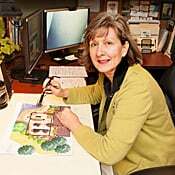 At the time, the couple had just finished renovating their house in the “arts and crafts” style, also known as “mission style.” It’s an architectural style that originated in the late 19th century and is characterized as simple, casual, and comfortable. It features geometric lines and flat panels and it celebrates the beauty of wood grain. This architectural style typically includes homes with low-pitched gabled roofs with broad eaves, large front porches, and lots of exposed wooden structural elements. While the couple did not have a lot of specific requests, they definitely wanted their landscape design to reflect this look. 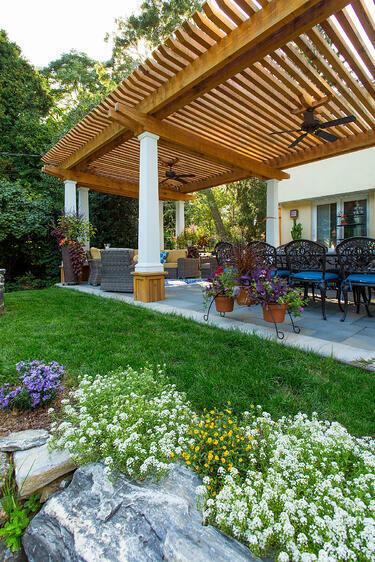 One way this was achieved was with the addition of a pergola that was designed to look Mission style. The exposed wooden beams absolutely added to the overall feel. The homeowners had also requested that their hot tub (an existing feature) not be covered so that their view of the stars was not blocked. The pergola suited this request as well. It provided the shade that the couple desired so that they could more comfortably enjoy the space in the daylight hours. But come evening, the careful positioning of the pergola ensured that it did not obstruct their view of the stars. 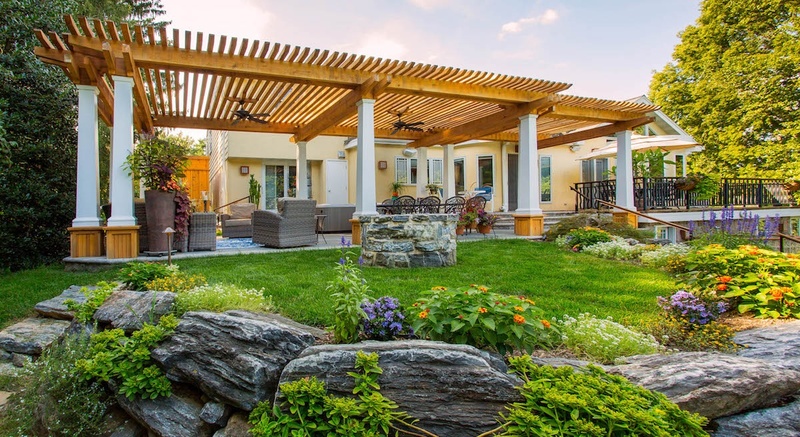 The pergola features landscape lighting so that it can provide light during evening entertaining. It also has some fans to keep the space breezy and discourage bugs during the warm days. And, we added some outlets in the space to plug in some outdoor lamps or provide charging for mobile devices. 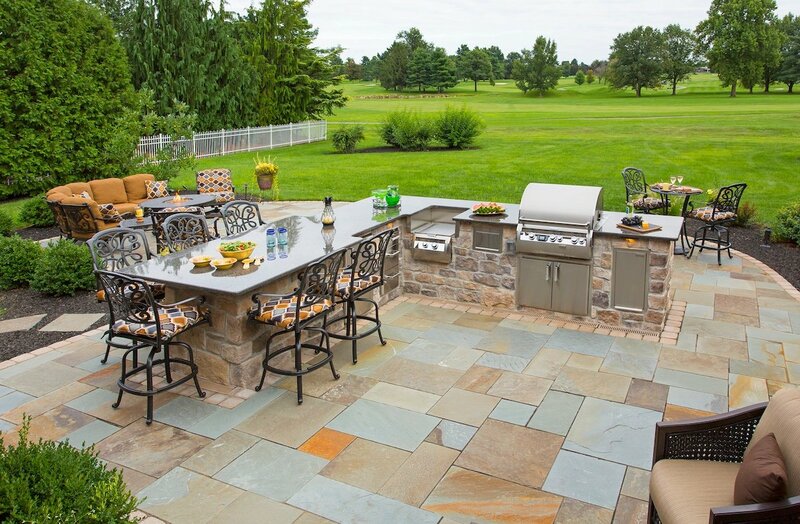 All of these additions make it feel like an outdoor room, minus the walls! 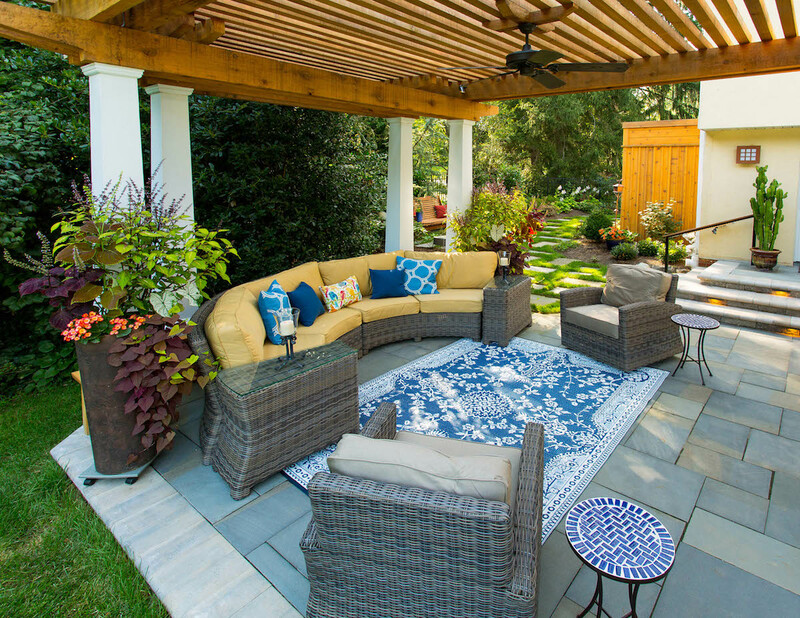 With the incorporation of some comfy outdoor furniture, it’s just the type of cozy space the couple had wanted. Of course, all of that new furniture created a new need—storage. 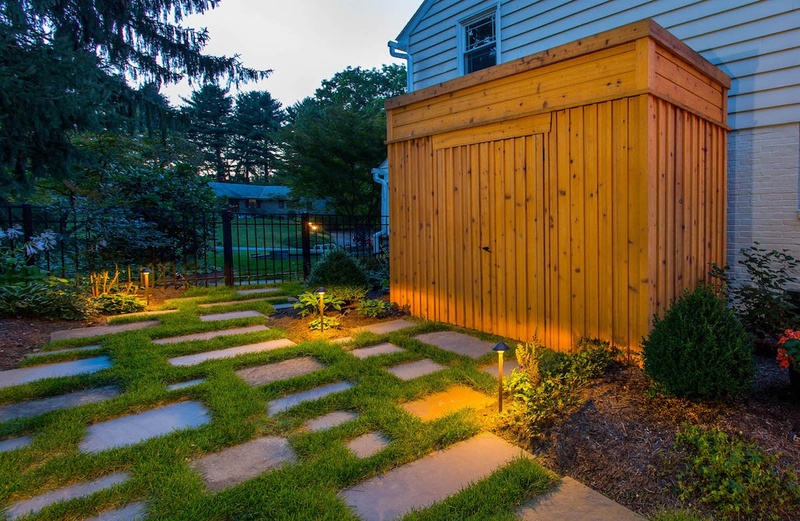 That’s why we added a custom shed, designed to mimic one that was on display at Longwood Gardens. This is an excellent example of how a functional need can still be an aesthetically pleasing addition to a property. Though the shed was added purely for storage, it goes a long way in adding to the Mission style look of the property with its gorgeous wooden exterior. Over by the shed, the couple also had a seating area with a nice bench. This shady spot was a great space to spend some quiet moments of rest and relaxation. This is one of the few grassy spaces on the property but the couple didn’t want just a big patch of turf. That’s why we came up with a unique design that had scattered pavers in a juxtaposed look. 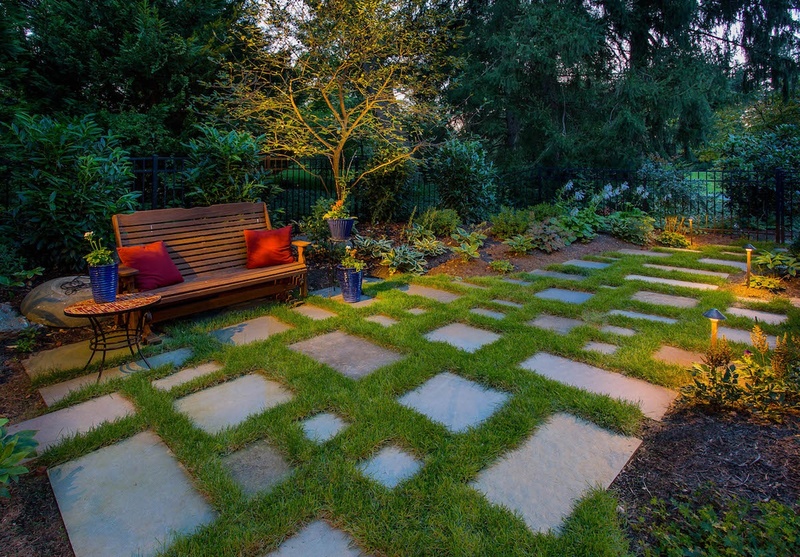 It creates an interesting stepping stone pathway to the shed or to the bench area. Adding various areas with steps to this property was also a huge addition in terms of making it more traversable. Previously, the property did have deck steps and a set of stone steps halfway down the slope to get to the pool. It was a bit more awkward. We aimed to make it more seamless. 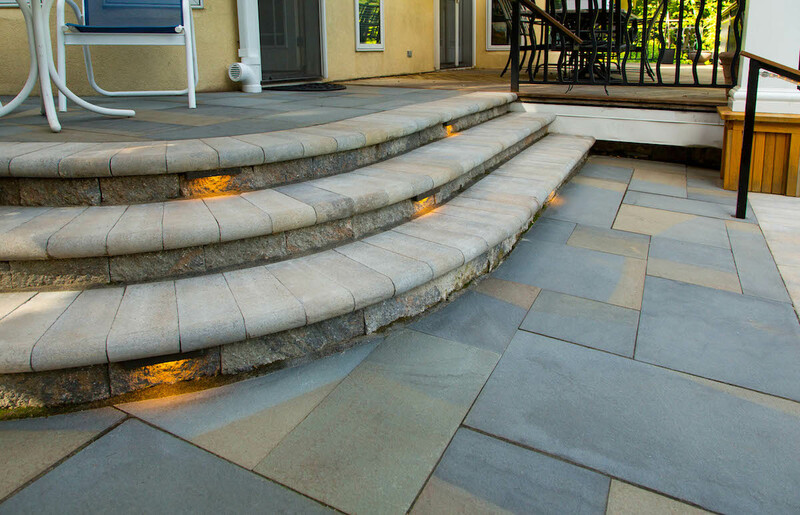 Now there are various areas incorporating stone steps, which naturally blend with the new stone patio. A large set of stone takes you all the way down to the pool area. Instead of feeling like two entirely separate areas, by breaking it up into a couple different levels, the property feels like it flows much better. It also adds a sense of “purpose” to the property, making all of those different levels meaningful rather than just a deck area up top and a pool below. Now the family feels as though they use the entire yard to its fullest. Safety was also a big concern with this multi-level property. 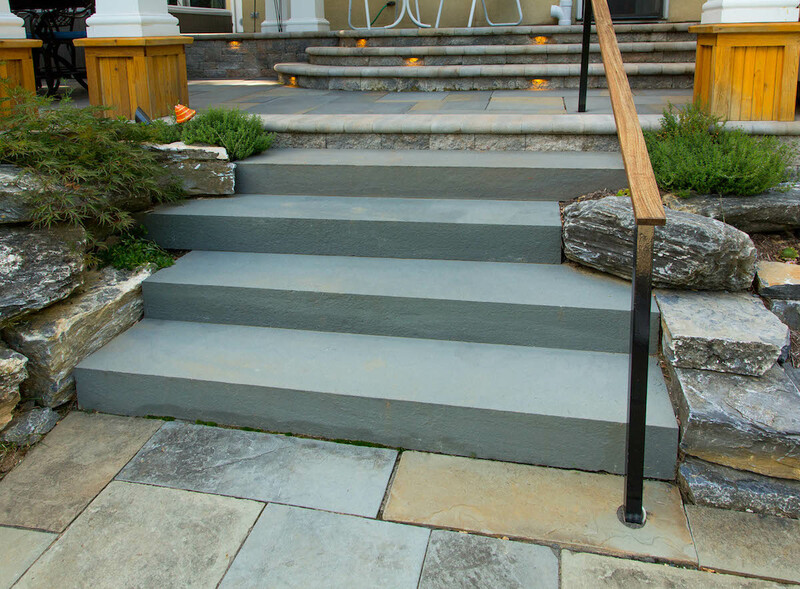 Easy-to-traverse and safe steps were important to this family as they looked to age-in-place in their home. The steps are well-lit to make it easy to walk down them when it’s dark. They are also a comfortable size to walk down safely. One of the big goals of the design was to “unify the look.” Because we were working with existing spaces—the pool area, boulders, and fire pit were already there—that the homeowners wanted to leave be, it was important that we added to the design in a conscientious way. In other words, we needed to make sure that the new spaces we added worked with what was already there. That also included adding materials that fit the space. The homeowners had mixed materials throughout the property and that was a look they liked. We brought that same style to the additions we added. The main surface of the new patio is flagstone. On the patio steps, we incorporated some Techo-Bloc pavers along with additional flagstone with bullnose edging. In the end, the homeowners were very happy with the result. Their wants and needs were not only met but added to with some additional ideas that we had (including making the space more multi-level). This project is an excellent example of how an existing property can be added to in a way that enhances what’s already there. 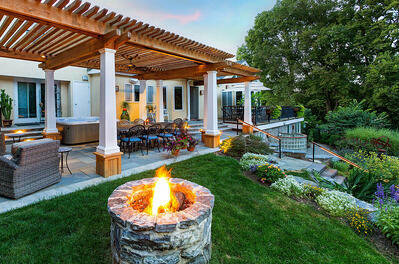 Of course, choosing the right Registered Landscape Architect was essential to this project’s success. With the grading challenges that were presented, there were many areas where this project could have gone wrong—or perhaps not come together in such a seamless way. 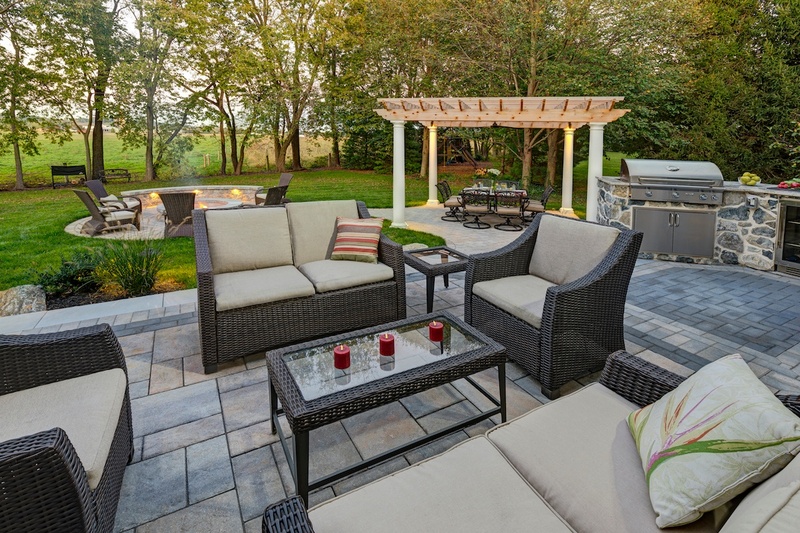 If you’re looking for landscaping in Leola, PA or surrounding areas like Lancaster, Reading, York, or Hershey, make sure that you find a professional that is up to the challenge. A lot of landscaping companies are used to producing cookie cutter designs on relatively flat properties and may have been unsure of how to even handle the grading challenges present in this project. You must remember that choosing the right landscape professional is a key to the overall success (or failure) of your design. 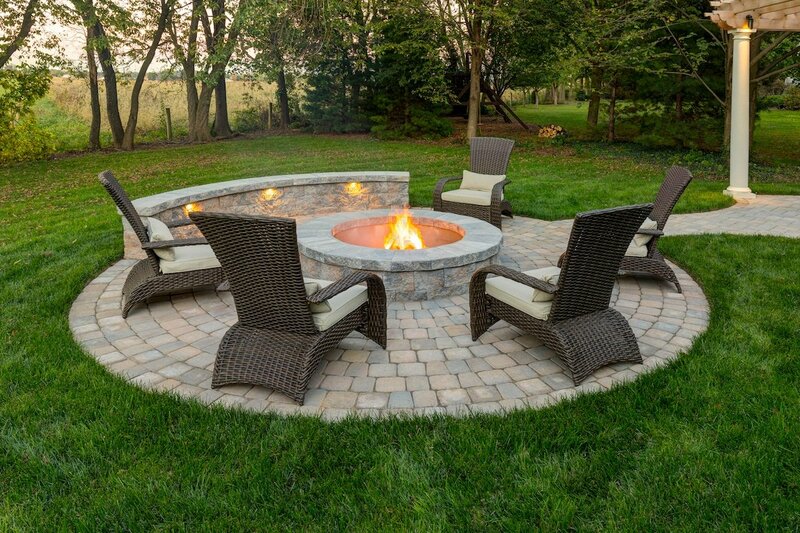 If you’d like to start a conversation about how you can bring your outdoor ideas to life at your Reading, Lancaster, Lebanon, York, Hershey or Leola, PA home, contact us for a free consultation or give us a call at (717) 276-9447.